Adriana Linares is a law practice consultant and legal technology coach. After several years at two of Florida’s largest law firms, Adriana launched LawTech Partners in 2004. She has years of experience working with law firms, legal departments, legal aid groups and even legal technology startups. She is a frequent speaker at national technology conferences and a regular contributor to legal blogs and publications. She has a Bachelors in Geography from Stetson University, a Masters in Corporate Communication and Technology from Rollins College, and speaks fluent Spanish. Adriana is an IAPP Certified Information Privacy Technologist. Today she serves as a technology consultant to the Florida Bar; is the Chair of the ABA TECHSHOW 2017, and serves on the board of the Florida Justice Technology Center. She hosts both the New Solo podcast and The Florida Bar Podcast on Legal Talk Network. In the second part of this two part series, Adriana Linares talks to a panel of solo attorneys about the many challenges of being a solo lawyer and offer practical guidance to solos on a variety of topics. 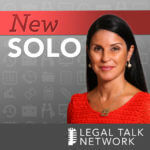 In the first part of this two part series, Adriana Linares talks to a panel of solo attorneys about the many challenges of being a solo lawyer and offer practical guidance to solos on a variety of topics. Jeff Joseph talks about why the SDCBA focuses on technology and why innovation should matter to all lawyers. Renee Stackhouse talks about being the chair of the SDCBA’s Technology Committee and how the committee serves its members. Taylor Darcy talks about why he chose to go solo and the technology that has helped make his practice successful. Tom Martin gives tips and tricks on implementing chatbots on small law firm's websites. Greg Garman talks about New Solo’s new sponsor Lawclerk and what it offers to solo and small firm lawyers. Renee Thompson and Zack Zuroweste talk about how law firms can prepare for and recover from natural disasters. Greg McLawsen talks about the life of the nomadic attorney and shares how he built his law firm around his desire to travel. Bill Galione talks about how he combined research, personal interest, and passion to establish a niche within personal injury law. Barbara talks about how to separate effectively after sharing an office with another firm. Additionally, She gives tips on hiring and what she does to make a supportive and creative work environment for her coworkers. Guest Joe Patrice talks about what it really looks like to switch from Windows to Mac and the advantages and disadvantages of using tablets for your business. ABA Midyear 2018: Is Online Dispute Resolution a Reality? Colin Rule talks about the potential uses of online dispute resolution in the legal industry. Legal Office Guru Deborah Savadra explains the details of creating tables of authority in Word. Andrew LeGrand discusses the ins and outs of using newsletters as a marketing strategy for your legal business. Ivy Grey and Daniel Heuman of Intelligent Editing’s PerfectIt talk about the editing services that their product offers and how it helps lawyers daily. In this legal podcast, Allan Mackenzie discusses how to use Microsoft Word effectively, including tips and tricks you can put into practice right now. Jeff Alford talks about why he chose to set up shop in small-town Kentucky and what technology he uses to help his practice thrive. 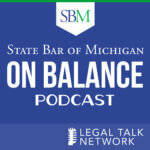 This legal podcast dives into topics like bar association benefits, outsourcing IT support, and transitioning from large firms to solo practices. 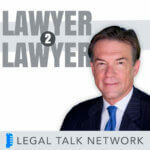 A legal podcast filled with resources that help make a solo law firm successful. This legal podcast covers the different tools Microsoft provides and how they lend themselves to a successful law firm. In this podcast episode, a solo attorney talks about how he started his practice, what technology he’s using, and how his business experience has helped him. Three solo professionals talk about their experiences running their own solo law firms and advice for those thinking about doing the same. Adriana Linares talks to three lawyers who have gone out on their own at the Bar Association of San Francisco’s first annual Solo and Small Firm Conference. Recently, attorneys have been “unbundling” their services to make them more affordable, a process also known as limited scope representation. Nate Cade talks about his experiences leaving a large law firm and starting his own solo practice. Mary Vandenack talks about her six simple steps for any lawyer looking to successfully implement alternative billing methods in their law practice. Mary Vandenack talks about how lawyers using alternative billing models in their law practice. Ray Abadin and Stephen Embry talk about why attending legal conferences is valuable for both large and small firms. Steven Silberbach and George Psiharis discuss the law firm index report and what this data reveals about the legal marketplace. Jeff Richardson of the blog “iPhone J.D.” shares his tips for lawyers using Apple mobile products. Michael Chasin, co-founder and CEO of Lexicata, talks about how CRMs can help solo and small firm lawyers with client intake as well as marketing. Adriana Linares speaks with Clio CEO Jack Newton, who shares what he believes are two big trends in practice management. Adriana Linares interviews four practice management specialists about the benefits of their products. Adriana Linares and John Stewart interview Florida Bar Past President William Hubbard about addressing regulatory framework in a timely way to deal with the increasing online proliferation of legal service providers. Adriana Linares interviews Pete Sweeney, chair of the Member Benefits Committee of The Florida Bar, at the 2016 Annual Florida Bar Convention. Adriana Linares interviews Ben Hill, Ramon (Ray) Abadin, and Bill Schifino, three Florida Bar presidents, at the 2016 Annual Florida Bar Convention. Adriana Linares talks with Jack Newton about Clio and the overall benefits that the cloud can bring to the practice of law. Adriana Linares speaks with Open Legal Services co-founders Shantelle Argyle and Daniel Spencer about starting their nonprofit law firm. Adriana Linares chats with Computer Forensic Examiner Craig Ball about the importance of understanding electronic evidence and e-discovery. Orange County Bar Association Technology Committee Chair Daniel Whitehouse discusses data breach notification procedures and what constitutes personally identifiable information.